hillviewasb.com: No Act of Kindness...is ever wasted! 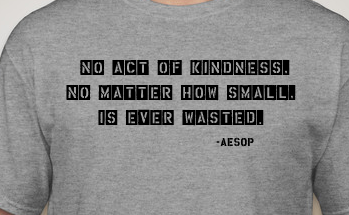 Below is a message from your ASB that will air on HawkTalk regarding the AESOP quote appearing on everyone's t-shirt. Enjoy! Parker: Good Morning Hawks, I am Parker here with Reid Diamond from ASB, to bring you this week’s Student Council Corner. Reid: Hi Hawks. This will just be a quick message to describe something you might be wondering about. Parker: You may have seen ASB or student council around campus wearing these gray shirts and thought, what does that quote mean? Reid: These shirts represent more than a marker to distinguish that we’re in student council, by wearing these shirts, we are trying to publicize a quote that we live by in ASB and hope you come to do so as well. Reid: This quote means that everything you do in your community has an impact, whether its helping someone study or even just saying hi in the hallways. Parker: So when you do anything kind even if its just a smile, it could brightens someone’s day. When the quote says, “is ever wasted” it means that every deed is noticed, whether it’s by the person you are directly helping or a bystander. Reid: So listen to this quote and understand that when Mr. Haug says, “You represent Hillview” be proud of that and reveal your amazing qualities we know you all have, to make someones day. Today try it out, you have the power to change anyone’s life. Parker: Oh and by the way, this quote is also on your new ASB Spirit shirts, so you can not only live the quote...you can wear it whenever you’re showing off your hillview spirit.